I had bought How Karpov Wins a few years back from Moe’s Books in Berkeley for $6. Towards the end of my time on the fellowship, I began studying the games in this book, but I didn’t make it too far. White didn’t do too much in the opening and Mednis lets the position go by without any remarks. But playing through the game, I was wondering, can’t Black just play 13…d5 here? I thought maybe there’s something between the Rc1 and Qc7, but there are simply too many pieces in the way. The computer agrees as well, giving …d5 as objectively best with clear equality. 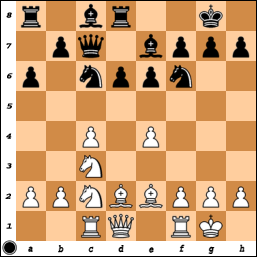 Instead, Karpov played 13…Bd7 and maneuvered behind his pawns for a while. It’s not hard to note …d5 as an option, and Mednis could even have worked it into his pre-built narrative because Karpov avoided straight equalizers on a couple occasions to keep more pieces on the board. Objectively, that shouldn’t have worked out as by move 25 or so, he was much worse, but his weaker opponent didn’t quite handle the position properly and he escaped to rough equality. I don’t remember reading quite as many interviews with Anand before, but over the past few years, there seem to have been a number of excellent ones – he seems to be more willing to engage with the media and actually say something rather than speak in simple platitudes. Here’s the latest one with The Indian Express. A couple points that have been mentioned or brought up here were noted in that interview as well: the unusual number of losses with white, Carlsen’s different approach to the opening (as opposed to being “weak” in the opening), and, of course, the general trend of more decisive results when he struggled to do anything but draw for the previous year. There was also a video interview with Nakamura I saw over at ChessVibes (for anybody else who watched this, was the music between every question/answer kind of annoying for you too?). There was less new stuff here in my view, except for maybe him saying his emotions are both a strength and a weakness for him. The real highlight of the interviews I recently read was an old one from 1976 about Walter Browne in Sports Illustrated (!). This is a pretty long article, 10 pages in the browser with a lot of content to it. I’ve played Browne a couple times in slow games (outrated heavily in both games) and once in a rapid game (drawn, when both of us were in general retirement), but I can’t say I’ve talked to him that much. However, reading this article, our postmortem about that last rapid game makes a lot of sense! The quick profiles of Grefe and Peters, two people I played a few times apiece in the ’90s were also very interesting – actually, I took a few lessons around then from Peters, working on specific openings and endgames. I never met the other 3 players of the 20-something crowd from that US Championship (Rogoff, Tarjan, and Commons).